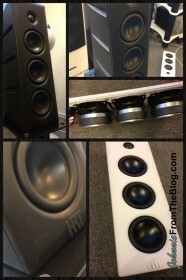 JohnnieFromTheBlog – HRT Stage, a compact audio system with high-end capabilities? I have had the exclusive opportunity to audition a completely new compact audio system which is targeted towards the high-end audiophile enthusiasts. In fact, it’s so new that at the time when I write this article it is not even out on the market yet. The system is a product from HRT – High Resolution Technologies, a California based company that has become well known for their lineup of affordable and high performing D/A-converters. The system, called “Stage” is a 3 piece compact audio system including one pair of very slim stand mount / bookshelf speakers and a main unit which powers the two speakers. HRT has just started to market the system, and so with a very confident attitude, claiming that HRT Stage will compete with any audiophile grade system for up to $20.000 USD. A very bold claim considering that HRT Stage will retail for around $1.000 USD in America and about €1.100 Euro in Europe. I met with the Swedish HRT concessionaire for an exclusive audition of the system. He explains that the “Stage” main unit includes not only a 2×70 watt amplifier to power the speakers, but also a USB DAC, an advanced DSP(**) (Digital Signal Processing) and EQ (Equalizer) that is fine-tuned and optimized to make the small speakers sound much larger than they really are. He further explains that it is the DSP(**) within the main unit where much of the magic is happening and what makes this system unique. The design is simple but futuristic looking and the system comes in either white or black. The speakers have no front grills and the drivers are visual at all times. The main unit is an awkward, nonstandard measurements cube with no visible buttons, displays or indicators what so ever. Input and output for power, speakers and USB is located on the back of the cube. The main unit reminds much of an active subwoofer, with some heat sinks visible on the back. The whole idea of the system is to be controlled from the signal source, which most likely will be a computer. The two speakers are each equipped with three 3-inch long throw bass drivers and a 1-inch textile dome tweeter and plays in the frequency range 45-20000Hz +/-3dB. The build quality over all sends me mixed signals. Both the speaker cabinets and the main unit is made of plastic with a rough textured finish, which to me both looks and feels very cheap. Sadly it feels more or less like any other cheap computer speaker system. But when looking inside the speakers we see bass drivers with cast frames and an absolutely huge magnet structure, larger than on most 6-inch drivers. I was playing the system with a Macbook Pro as signal source connected through USB. My music media was lossless tracks from iTunes but also Spotify Premium using “Extreme” quality setting. I started out playing tracks from a long mix playlist that apparently was put together for the purpose to demo the system. The mix playlist contained mostly instrumental, acoustic and singer-songwriter tracks, and was obviously hand-picked to emphasize the strongest features of the system and really show it off from its best side. Nothing wrong with that! The sound stage is impressive, large and full, giving you a very good feeling of presence. Even though the speakers are small, they do have some bass, the frequency response is definitely there, but because of the obvious physical size limitations it’s never really solid or full. After I had been playing around for a while with the mixed playlist that was given to me, I switched to my own selected tracks that I enjoy myself. I started out with listening to a few tracks from Fink – Distance and Time. Fink, being the same type of singer-songwriter music like the tracks I just played from the demo playlist, sounded like he was right there singing in person. While playing well recorded electronic music, such as Infected Mushroom, Lulu Rouge and Roisin Murphy, the music is really there, straight in your face and around you. It’s large and three dimensional but far from accurate and neutral. It is very noticeable that the built in Digital Signal Processing(**) and EQ, without a doubt do “something” to the music. I’ve listened to other systems with “Virtual Surround Sound” from 2 speakers before, and usually the sound feels very fake and artificial. HRT Stage does this much better but it still feels a bit artificial at times. The sound stage did at times feel too polished and clean. With this in mind I moved along to play some rock, metal and gothic. I wanted to hear how HRT Stage delivers music that might not be so perfectly recorded. First I played some studio recorded tracks from artists such as Sick Puppies, Halestorm, Lacuna Coil and The Browning. This time it’s even more obvious that the system tries to prettify and clean up the music that is delivered, it really takes the edge away from electric guitars making it sound more like a kitten rather than a tiger. Where you’d expect it to be somewhat rough, metallic and in-your-face it is now instead smooth like silk gloves. And with this genre of music, that is not a good thing. Last, but not least, I played some tracks by Within Temptation from the live album Black Symphony. Being a live recording this album already has the live feeling to it and sounds completely awesome on most decent stereo systems. HRT Stage totally destroys the entire sound stage by making it shrink way back against the wall, ending up sounding muffled and exhausting to the ears. I’d like remind everyone that all systems have their advantages and disadvantages. HRT Stage delivers a very unique sound and shows off its strongest advantages together with well recorded instrumental, acoustic and vocal music, but does most definitely not play all music well. This system is not neutral or transparent in any way and it does tweak and color the music, for both better and worse. Make sure you audition this system with your own music before you decide to buy. It might blow your mind and suit you perfectly, or it might totally destroy your listening experience. I want to finish off my conclusion with rating the HRT Stage from two perspectives. The first perspective is where HRT want to target this system towards high-end audiophiles to compete with any system for up to $20.000 USD. From that perspective I want to keep myself short by simply saying: No, not going to happen. The second perspective is when we compare HRT Stage to similar systems within the same physical size and price range. Personally I would want to use a subwoofer with this system, but seeing HRT Stage for what it really is; a reasonably small and easy to use compact audio system, it is actually a great system together with the correct music. **Update: Since HRT Stage is a completely new product and the fact that it is not even released yet, also means that there is a lot of specifications and features not yet revealed. When I auditioned HRT Stage there was mentioning of an integrated DSP. Today I learn that there is in fact no DSP at all in the system, just the built in USB DAC. The sound characteristics that HRT Stage deliver is all a result from the combined components of the system in whole. The drivers, the cabinets, the included amplifier and DAC and so on. HRT themselves assure us that there is no other signal processing going on inside the system. Update 2: The Swedish HRT concessionaire, has now also clarified that there is no DSP in the system. Further he explains that this was a misunderstanding between him and HRT. Nice review. In what way did you think the system wasn’t neutral and that it colored the music? Hello Fredrik! Thank you. When I say that the system is not neutral and that it colors the music, I compare it to what a normal system would do; reproduce the music as accurate as possible. Instead of reproducing the music according to the original source, HRT Stage tries to make it even better than the original. In some cases it creates the illusion of a better sound stage, and in some cases it just adds “something” to the music that makes it sound like artificial surround sound. DSP system IMO do this a lot, make Electronic music sound great but not. the laws of physics is still valid. Sad that they have fogotten to make the speakers look good, instead they look cheap IMO (only from photos). Hur vet du att Stage färgar ljudet och att det inte är ditt ref system som återger fel? How do you know that Stage colors the sound, and that it is not your ref system that reproduces the error? Vilket system har du som återger korrekt? Hello Åke. As I wrote in my conclusion: No system is perfect for all kinds of music. That is also why I as often as possible rely on my many years of listening experience from concerts, musicals and live performances as reference, and not another system. I know what a Steinway Grand Piano Model B sounds like, I know what a Gibson Les Paul classic guitar on a Marshall JCM 2000 amplifier sound like, and so on. So as I said, I try to trust my own experience and ears as much as possible and not to rely on another “reference system”.